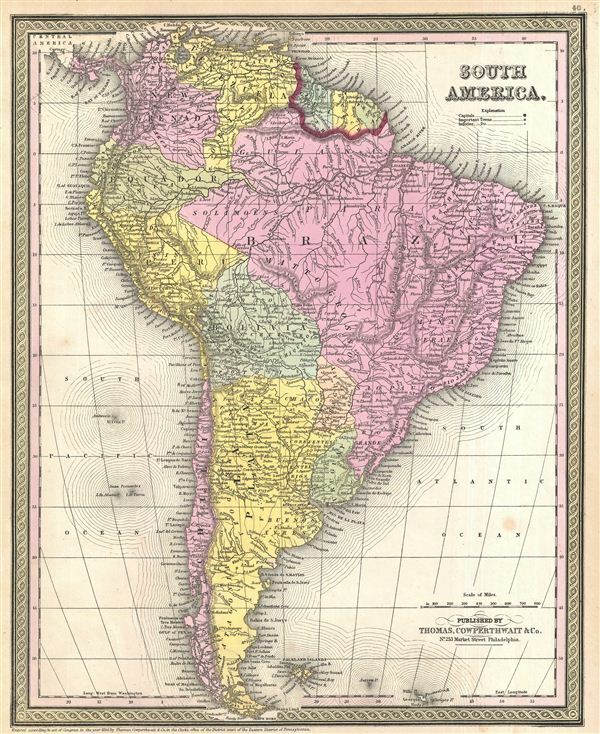 A fine example of Thomas Cowperthwait and S. A. Mitchell's 1854 map of South America. The whole is engraved and colored in Mitchell's distinctive style with green border work and vivid pastels. Political and topographical features are noted and color coded with elevation rendered by hachure. The map depicts the whole of South America inclusive of Panama and the Falkland Islands. Ecuador is depicted extending well into central South America along the Amazon River – territory that is now claimed by Brazil. Peruvian and Chilean claims to a small stretch of coastline formerly claimed by Bolivia are noted. Colombia is identified under its former name, New Grenada. Rumsey 0523.008 (1846 edition). Phillips (Atlases) 814.